For other uses, see Liturgy (disambiguation). The word liturgy, derived from the technical term in ancient Greek (Greek: λειτουργία), leitourgia, which literally means "work of the people" is a literal translation of the two words "litos ergos" or "public service". In origin, it signified the often expensive offerings wealthy Greeks made in service to the people, and thus to the polis and the state. Through the leitourgia, the rich carried a financial burden and were correspondingly rewarded with honours and prestige. The leitourgia were assigned by the polis, the State and Roman Empire and became obligatory in the course of the 3rd century A.D. The performance of such supported the patron's standing among the elite and the popular at large. The holder of a Hellenic leitourgia was not taxed a specific sum, but was entrusted with a particular ritual, which could be performed with greater or lesser magnificence. The chief sphere remained that of civic religion, embodied in the festivals: M.I. Finley notes "in Demosthenes' day there were at least 97 liturgical appointments in Athens for the festivals, rising to 118 in a (quadrennial) Panathenaic year." However, groups of rich citizens were assigned to pay for expenses such as civic amenities and even payment of warships. Eventually, under the Roman Empire, such obligations, known as munera, devolved into a competitive and ruinously expensive burden that was avoided when possible. These included a wide range of expenses having to do with civic infrastructure and amenities; and imperial obligations such as highway, bridge and aqueduct repair, supply of various raw materials, bread-baking for troops in transit, just to name a few. The liturgy mainly consists of chanting or reciting a sutra or passages from a sutras, a mantra (especially in Vajrayana), and several gathas. Depending on what practice the practitioner wishes to undertake, it can be done at a temple or at home. 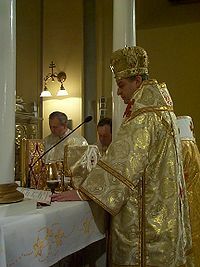 The liturgy is almost always performed in front of an object or objects of veneration and accompanied by offerings of light, incense, water, and food. Jewish liturgy is the prayer recitations that form part of the observance of Rabbinic Judaism. These prayers, often with instructions and commentary, are found in the siddur, the traditional Jewish prayer book. In general, Jewish men are obligated to pray three times a day within specific time ranges (zmanim). while, according to the Talmud, women are only required to pray once daily, as they are generally exempted from obligations that are time dependent. Salat is preceded by ritual ablution and usually performed five times a day. It consists of the repetition of a unit called a rakʿah (pl. rakaʿāt) consisting of prescribed actions and words. The number of obligatory (fard) rakaʿāt varies from two to four according to the time of day or other circumstances (such as Friday congregational worship, which has two rakats). Prayer is obligatory for all Muslims except those who are prepubescent, menstruating, or in puerperium stage after childbirth. ^ "liturgy". Oxford English Dictionary (3rd ed.). Oxford University Press. September 2005. (Subscription or UK public library membership required.) - "2.a. A form of public worship, esp. in the Christian Church; a collection of formularies for the conduct of Divine service." ^ Compare the view of morning and evening prayer as liturgy in Claiborne, Shane; Wilson-Hartgrove, Jonathan; Okoro, Enuma (2010). Common Prayer: A Liturgy for Ordinary Radicals. Grand Rapids, Michigan: Zondervan. ISBN 9780310326212. Retrieved 2019-01-06.